Windows 10 full image backup creation guide is here for you to help you successfully create backup of all important files and data on PC desktops and laptops. Here we have explained how to create full image backup of Windows 10 on home or work PCs. Windows 10 is the best Microsoft operating system to date, it is packed with tons of features that help you to be more productive and as always multi-tasking, which has been the hallmark of Windows OS, works like a charm. You can use Windows 10 PC for both entertainment and business purposes with equal ease, there are no complex learning curve to master various tasks. But as is the norm with PC systems, avoiding unexpected PC crashes is out of your hand, there could be several reasons behind PC crash that could result in the loss of data and important work files if they are not saved beforehand. In Windows 10, Microsoft has made it easy for you to create quick backup of your files and data to avoid data loss due to PC problems. You can use instructions in this guide to create full image backup on PC Windows 10, same method works on Windows 8.1 as well. Before jumping on to the actual guide, you should be familiar with reasons that make Windows 10 full image backup creation very important. These reason would also help you to understand what’s been causing the data loss on your PC. When the PC crashes, all unsaved work and data get deleted and reinstalling files could take both time and effort not to mention the financial damage that it could inflict if the lost files happen to be business or work related. Prevention is always better than cure. That’s why having all important data backed up at all times makes perfect sense both financially and in terms of saving time on recovering lost data. The full image backup on Windows PC saved everything on your PC from files, system settings, OS updates and rest of the stuff on computer. Which protects against data loss in case of crashes. However, there is one downside to the full backup that you cannot saved specific or individual files as it creates backup for the entire system. But this compromise is worth it because without regular full backup on Windows PC, you run the risk of losing all PC data in case of an unexpected malfunction or crash. Full backup is perfect option for those you experiment a lot with Windows OS or have Windows Insider Program updates enabled on PC as it enables them to recover lost data in the event of PC crash. With full image backup, you can reinstall Windows 10 or Windows 8.1 OS back to normal with all files, settings and updates restored from where you left off. There are several backup options on Windows 10 or Windows 8.1: you can use OneDrive backup, File History or basic image backup. If you are interested in full backup then the basic image backup option is best for you because it saved all PC data. Other two backup methods OneDrive and File History are best for saving individual or specific files backups. 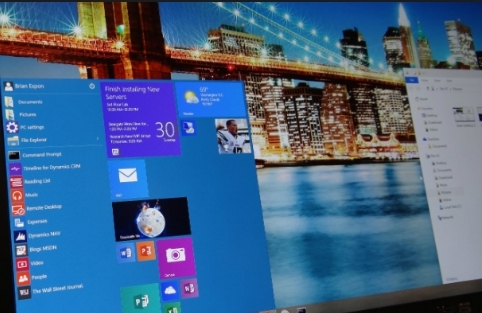 Here are the steps to create full Windows 10 backup or Windows 8.1 backup. It doesn’t duplicates files and also create backup history with time and date for easy recovery. 1 – Open Control Panel on Windows PC. 2 – Set it to large icon view from the top-left corner drop-down box. 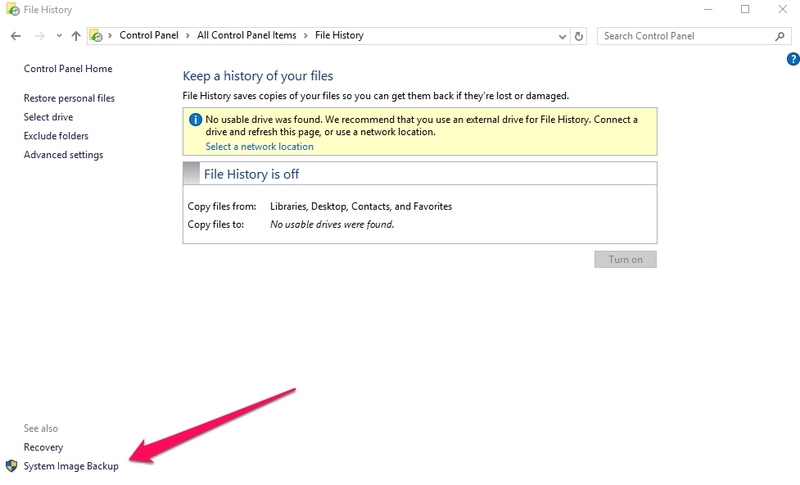 3 – Click on File History option. 4 – In File History, click on System Image backup. 5 – You can use external storage device such as hard drive or USB with enough storage space for saving backup files. 6 – Now, when asked where would you like to save the backup, choose external storage device option for quick backup. There are other options like DVD or network share but they take a lot of time for creating full image backup. So, select external storage device, like hard drive, and hit the NEXT button. 7 – Check drives that you want to create backup of and hit the Start Backup button. Wait for the process to complete, it could take several minutes to hours depending on how much data is being backed up. You can keep on working on the PC while the backup is being created in the background. After the backup keep the external storage device, hard drive or USB, at a safe place where you can conveniently get it in case of urgent PC backup restoration. It is always wise to regularly backup data on PC to keep an updated copy of backup with you at all times. Make full image Windows backup at least once a month. See steps below to restore the backup that you created using the above mentioned guide. Connect the external storage medium, hard drive or USB on which you created Windows backup, with PC. On backup restore setup window, click NEXT and then ‘repair your computer’ link on the bottom left corner of the screen. Now go to Troubleshoot > Advanced > Options > System Image Recovery and find the backup version that you want to restore. Click Next > Finish and wait for the backup to restore completely. Again, depending on the data, it could take minutes to hours for the data to recover. After full image backup, you can stop worrying about losing PC data ever again. Although it could be a lengthy process at times to backup and recover full image backup on Windows 10 PC but its better than permanently losing data. Tech enthusiasts who tinker a lot with PC and expose computers to sudden crashes would do themselves a favor by following instructions in this guide to create and restore full backup on Windows 10 PC. Create Full backup now and then regularly once a month to never have to worry about losing previous data. If you have any queries regarding Windows PC backup, then share with us in the comments section below.